Building Character – It’s What’s in the Water! St. Thomas’s has introduced a new format to daily Chapel this year that invites our students to listen closely to a story and reflect in a large group on themes relating to character, ethics and values. 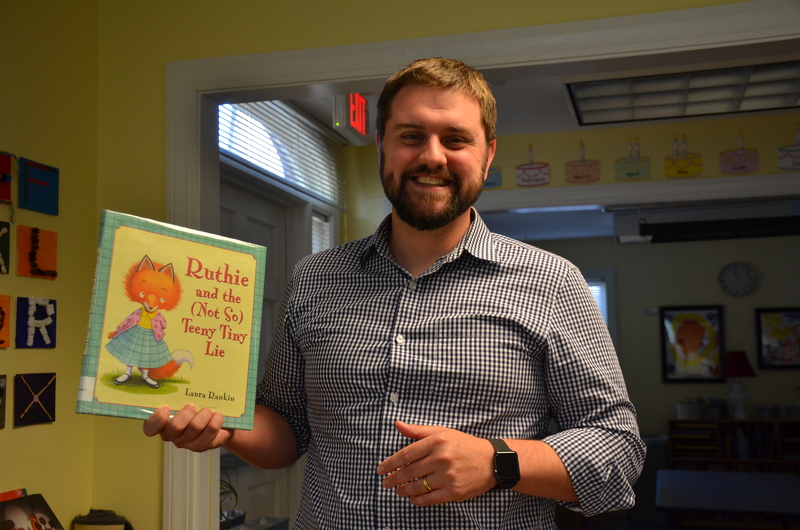 Our school Chaplain, Eric Snow, uses storytelling as a creative and engaging way to get the children invested in learning about themselves and the world we share. The stories Chaplain Eric chooses reflect larger themes throughout the year including Hispanic Heritage, Character Counts, Native American Heritage, Black History Month and many, many other occasions of celebration and learning. He reads these to students on Mondays and spends time reflecting with them throughout the rest of the week and helps them unpack the story to illuminate the character trait or value that we are highlighting. Courage, bravery and celebrating differences are some of the topics that have already been covered so far this year. On one Monday in Hispanic Heritage Month, Chaplain Eric read Marisol McDonald Doesn’t Match, a children’s story about celebrating differences. It is a bilingual story about a Peruvian-Scottish girl who likes mismatched clothes (polka dots and stripes together) and mismatched food (peanut butter and jelly burritos). Even though others try to get her to chose to be one thing or another, or eat one kind of food like they do, Marisol just can’t do it – and that’s just fine with her! Before reading, Chaplain Eric asked the students to look and listen for themes of individuality, creativity, and how we treat each other’s differences. That Tuesday, Chaplain Eric led the students in a discussion: “What differences do you see here at school?” and “What are some of the ways you are different?” The answers ranged widely, and, ultimately, the students agreed that differences are a part of what makes St. Thomas’s so special…”and that is just fine with us!” The rest of this week tied the themes found in the story with Hispanic Heritage together as our sixth-graders introduced the school to a range of famous Hispanic leaders in a variety of fields (from politics to painting and poetry). This week, St. T’s has been celebrating National “Character Counts!” Week in Chapel. “Character Counts! Week” is a U.S. Senate approved national celebration that centers on the young people in our country becoming “involved, caring citizenry of good character.” Chaplain Eric read the book Ruthie and the Not-So-Teeny-Tiny Lie on Monday, and on Tuesday led the community in a discussion about what we can learn about “character” from this story about integrity and honesty. Building character, that’s what’s in the water! From Chapel to the classroom, a St. T’s education helps students learn community norms, reflect on their roles in upholding our traditions while branching out with new ideas, and make the world a better place – starting with each one of them!